We want your decision to use us to pursue your claim to be the right decision for you. We are committed to providing a professional, simple to understand and easy to use service. We aim to be completely transparent in all our dealings with you and these Terms and Conditions explain our obligations. They will be at the heart of our relationship, and our contract with you. Please take the time to read them carefully.We hope you are happy with our service, but if you should have any reason to complain, please do not hesitate to contact us. A copy of our complaints handling procedure is available both on our website or by request. Brownstar Ltd, trading as Claimspower.com (“Claimspower”), is a limited liability company and a third party claims handler, Regulated by the Claims Management Regulator in respect of regulated claims management activities, Authorization No. CRM31943, and registered in England and Wales with number 06297942. 2.2. ‘The Business’ or “us” means Claimspower.com. “Services” means the work carried out by us including assessing the viability of, preparing, submitting and negotiating your claim(s) and negotiating payment of compensation or any other remedy or relief in respect of your claim(s). 2.9. ‘The Regulator’ means the Claims Management Regulator in respect of Claims Management Activities. 2.10 “Fee” means the fee payable to Borwnstar for services to you. 5.6. In the event of non-payment of the Company’s fees by the Client, the Company reserves the right to recover reasonable costs incurred in pursuing any sum the Client owes the Company. The costs shall include debt recovery fees, court fees, bailiff fees and any other administrative costs or professional fees incurred by the Company. 6.2. The Client has the right to cancel this agreement within 14 days of signing the Company’s Letter of Authority and Terms of Business. The 14 day period will commence from the date the Client returns to the Company the Questionnaire and signed Letter of Authority and Terms of Business instructing the Company to act on the Client’s behalf. Cancellation of the agreement must be made by post or by email or telephone to the Company. 6.3. Should the Client terminate this agreement after the 14 day period, set out in paragraph 6.2 above, but before a Client Acceptance Offer has been made, the Client agrees to pay the Company a reasonable hourly fee may be made for work completed on behalf of the Client. 6.4. 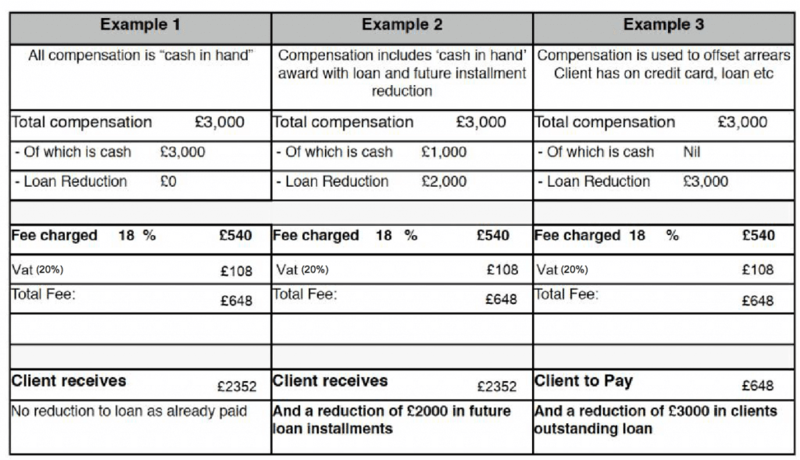 If at the time of cancellation, we have received an offer of compensation, which has been calculated in accordance with the rules of Financial Conduct Authority or the principles used by the Financial Ombudsman Service and which we recommend is accepted by you, we reserve the right to charge the full fee. 7.3. Within 4 weeks of receipt of the complaint, the Company will send a final response adequately addressing the complaint or a holding response explaining why the Company is still unable to make a final response, giving the reasons why and an expected date for a final response, If you remain dissatisfied, you can contact the Legal Ombudsman at PO BOX6804, Wolverhampton WV1 9WG. These terms of business shall be governed and construed in accordance to the laws of England & Wales and the parties shall submit to the non-exclusive jurisdiction of the Courts of England and Wales.